* “Sample not for sale” sticker on front. ** Thick cardboard sleeve and SFA 406 on back of sleeve. *** 1982 CBS re-release without GAP references and thin glossy sleeve. **** Date on test pressing: 7/10/83. ***** Δ is the sign of the cutting engineer. 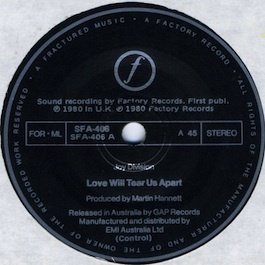 Notes: The SFA SINGLE was the first Australian Factory release (and the first for GAP). The prefix SFA stands for Single Factory Australia; the number is from the generic EMI catalogue. Date on all labels: 18/4/80. The 12" reached the Australian Top Twenty. There also is a promo video. Says Andrew Penhallow: "The first promo-video we got from Factory was 'Love Will Tear Us Apart' which I had to re-edit. They sent me the footage but the sound was out of sync. They couldn't get it right. As we were in the Top 20 we wanted something for TV in OZ. I spent an afternoon at a video facility with an editor and re-striped the sound off the master and edited the vision to fit - there are some jerky edits but it improved it enough to get TV coverage here. In fact, Factory used the version on one of the JD video releases and on UK TV. We also got 'She's Lost Control' and 'Transmission' as promo-videos. They were TV studio performances [apparently from 'Something Else'] and they were very good as they really captured JD."